We’d love your help. Let us know what’s wrong with this preview of Little Bits of Karma by Laura Simmons. To ask other readers questions about Little Bits of Karma, please sign up. Holly O’Rourke has been through two failed marriages and is stuck in a stale relationship with James Macklin. She can feel the distance between the two of them the last couple years but cannot figure out what is going on. A chance meeting with a co-worker has given her feeling for him and she is torn between Charlie and James. So Holly decides to visit a psychic to figure out what to do and begins a journey through her past lives. She learns that many evens and people have affected her throughou Holly O’Rourke has been through two failed marriages and is stuck in a stale relationship with James Macklin. She can feel the distance between the two of them the last couple years but cannot figure out what is going on. A chance meeting with a co-worker has given her feeling for him and she is torn between Charlie and James. So Holly decides to visit a psychic to figure out what to do and begins a journey through her past lives. She learns that many evens and people have affected her throughout time and she is hoping that this time she gets her happily ever after. This was an interesting story. Holly has the troubles of learning about James and his wanderings which causes a whole fresh set of drama in her life. But the part I really enjoyed was when she would visit her different past lives. It was really fascinating how she would keep running into the same people in her lives and not just the romantic area. She seems to keep dealing with the same issues so it was about time that she come out on top. This book is not one of my usual reads but I’m glad that I decided to read it. This is one that I recommend checking out, you may be pleasantly surprised. I received Little Bits of Karma from Silver Dagger Book Tours for free. This has in no way influenced my opinion of this book. This book was really great. Once I picked it up I could not put it down. It follows Holly a woman who believes in reincarnation. Her fascination and interest leads her to a psychic which leads her into looking into her past lives. It really is an interesting read. I love books like this. I love learning about history and all of Holly's lives were really cool to look back on. I have to say at first I thought I wouldn't really like the book because Ive never thought much about Psychics and reincarn This book was really great. Once I picked it up I could not put it down. I love books like this. I love learning about history and all of Holly's lives were really cool to look back on. I have to say at first I thought I wouldn't really like the book because Ive never thought much about Psychics and reincarnation. I am so glad I read this book though. It was deeply intriguing from page one. It was written very well. Based on the Prologue I thought it would be confusing, but it was a very smooth read. It was full of good, bad, and lots of romance. I was gifted an e-copy from the author in exchange for an honest review. When I read the book description I was intrigued and decided to accept this book for review. I have never read a book by Laure Simmons, and I didn’t know what to expect. The story if fascinating, and did enjoy Little Bits of Karma. The immediate difference in this book is the age of characters. Most of them are middle-aged, but that did not detract from my reading pleasure. In fact, it made the book unique. I can honestly say it is the most unusual book I have ever read. Holly O’Rourke is forty-five years old and has been through two bad marriages, and her current relationship is stagnant. James Macklin and Holly have been together for eleven years. The first nine were mutually fulfilling, but during the last two, they have grown apart. James is keeping secrets, and Holly can’t put her finger on what is wrong. After running into Charlie Thomas, a co-worker, she starts to question her relationship with James even more that she had been. When she seeks out a psychic who may be able to give her some insight into her past lives and information regarding her future relationships. This starts Holly on a path of discovery. Through her dreams, she learns about her relationships with the men in her life, men who have followed from one life to the next. Will her past give her the answers she is seeking, or only leave her with more questions. Is she supposed to be with James, or does her karma lead her to Charlie? While I did find Little Bits of Karma intriguing, I did have a difficult time with some aspects of the story. First and foremost is the constant head hopping. While interest to have so many introspections from the main character, it kept me from truly becoming invested if Holly and James. That may have been a good thing because Holly’s relationship with James is very convoluted. Another problem I had was when Holly regressed back to other lives as far back as Atlantis. I felt as if I was still reading a contemporary story because the language and attitudes were way too modern for the historical times of her regressions. 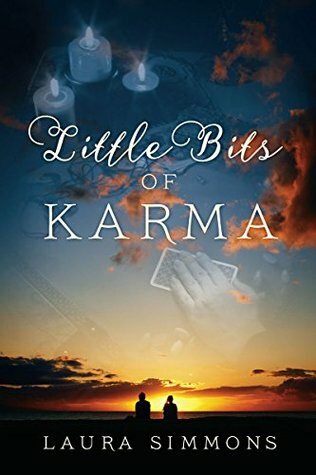 Nonetheless, I am glad I read Little Bits of Karma, and if you are looking for a story that will titillate your imagination and get you wondering whether reincarnation exists, then you will be fascinated by this unique book. Happy reading! I recieved a free copy of this book in exchange for an honest review. I will post that review here after it is posted on the intended website. What I liked: What first caught my attention was the cover. It is beautiful and just goes to show you that we often pick up books because their covers attract us first. The subject matter of reincarnation was what prompted me to read this novel though. The past lives aspect as well as the paranormal aspect of being psychic is something that is unique and I I recieved a free copy of this book in exchange for an honest review. I will post that review here after it is posted on the intended website. Most of the characters I received a free copy of this book in exchange for an honest review. If you like this book you might check out these works if you like romance: Asylum Harbor by Isla Grey, The Black Jewel by Cassie Clark, and Patterns of Change by Terri Dulong. Little bits of karma is a cute romantic read blended with reincarnation, karma, and coincidence. I really enjoyed all the paranormal aspects, such as all of Holly's past lives. All that has happened between the characters in their past lives really added to they way they are in the current ones creating more depth to the characters and the story. The romances between the characters were also really sweet to follow. However there were a few small aspects to the story that made me feel a little indifferent to the book as a whole. Many of the conversations has a bit of an interrogation vibe and several of the "coincidences" seemed almost forced, making it seem a little ridiculous. Haha and I must comment on the fact that the story ends with "and they lived happily ever after", I mean, that is a little bit cheesy. Overall it was a pleasant read and I did enjoy it for the most part, however I feel a little indifferent to the book as a whole. It's a good, light, cozy read, but nothing overly fantastic. First off let me say the front cover is beautiful and the subject of the book intrigued me. That said the book was very good. Well written and the characters are developed nicely. I will say it was a slow beginning fro me in reading this book but was I got into it the story flowed easily. I liked that I was able to keep up with characters due to the beginning when the author gave me a character listing of present and past characters. The story line is one that will keep you interested. The story First off let me say the front cover is beautiful and the subject of the book intrigued me. That said the book was very good. Well written and the characters are developed nicely. The story revolves around Holly and her love life both present and past. As Holly starts to dig into her past lives she learns that it has a big impact on her present day love life and how she relates to it. I really enjoyed how derives Holly’s pas life’s are. Over all this book was an enjoyable read and if you enjoy the subject of past life, tarot cards and such then you will most definitely enjoy this book. Wanted to read this book for a few reasons, the front cover is breathtaking and the subject interests me. Love the very beginning where the character list is and who they represent in prior centuries. The book, to me, is like 2 novels in one. There is the present story of Holly and her love interest, her work interest and her exercise interests. Once she gets the cards read for her and learns more about past lives she dwells into finding out more. The past centuries are fascinating to me as they are the same present day characters but in a new light. Just when you think you know how the story will go a tragedy occurs or a medical emergence. Quite coincidence about but magical on many counts. Great story and love all the detailed explanations of what things really mean. A very nice weekend read with an engaging storyline and intriguing plot that keeps you on your toes. One of those where you pour yourself a glass of red, turn the lights off and let the world go by as the words take you somewhere altogether different. Unique read mixed with the paranormal elements made this an interesting read!